It was going to be another hot sunny day in Vietnam, but this would go down as one of my most memorable days by far. A hand full of Charlie Troopers including Roy McDonald and myself hitched a ride in the back of a 3/4 ton Jeep and headed to Long Binh to attend the Bob Hope USO Christmas Show. This is where I sat on that hot and sunny Christmas Day. 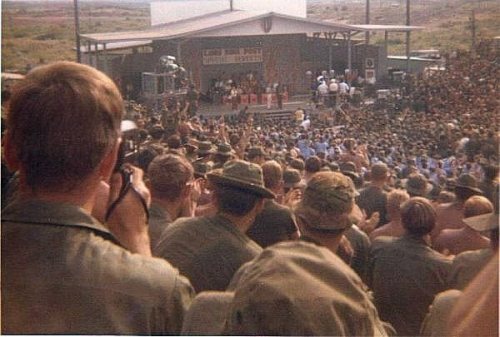 A few GI’s climbed trees and telephone poles to get a better view of the stage. The show ended with everyone singing “Silent Night” and not a dry eye anywhere. 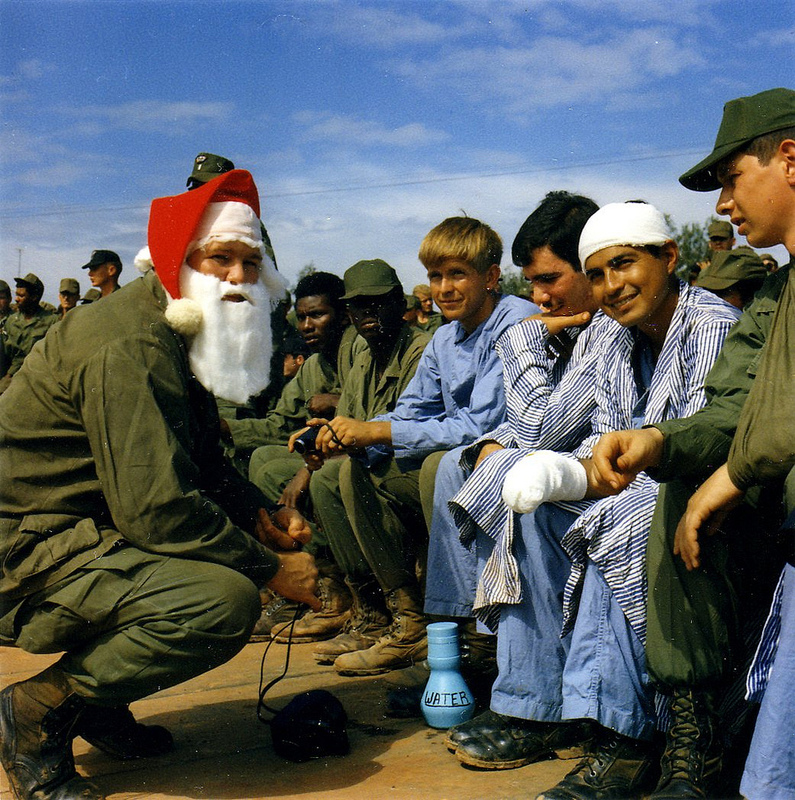 Vietnam “Santa Claus” with a group of hospital patients during one of the 1970 Bob Hope Christmas Shows. 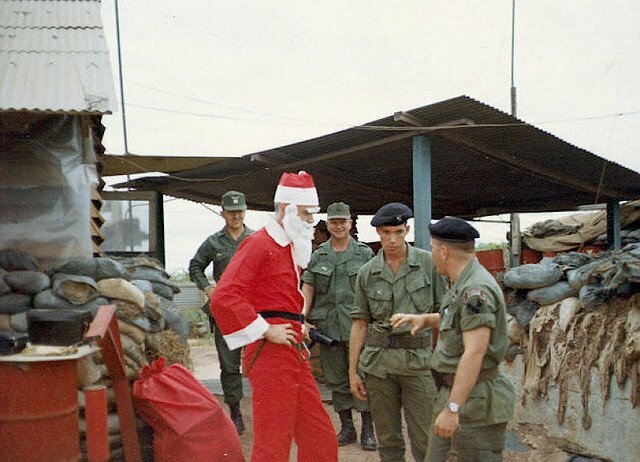 The man to the right of Santa is CPT Enn Tietenberg, 1/9th’s XO. Yes, I remember CHRISTmas Day, 1967. A few of us hiyched a ride to Long Binh to see the Bob Hope Show. The most memorable day I spent in that hell hole. You are correct, at the end of the show, singing Silent Night, not a dry eye anywhere. Thanks for bringing back the memory. We then went back to the 90th and tied a load on. Being chosen to go to the Bob Hope Christmas show was an honor. I had been in country since April (1968) and thought I would be chosen. Instead we old timers were told the Troop was going to send the newbies because that would pick up their spirits. It made me mad at the time. I understand the reasoning now. Pat, I feel they had their reasoning all screwed around; the old timers (like yourself) should have been chosen to go, to ‘regain’ your spirits. I have to be honest…. I DO NOT REMEMBER ONE SINGLE HOLIDAY IN VIETNAM! I guess it is because we worked, as you all did, seven days a week. And the some. I do not know why, but in the last year or so Viet nam, and everyone I met there, everything I did there is in the back my mind most of the time. This is why I love seeing photos, anyone’s photos, weather I know them or not, is important to me. Maybe nearing retirement now, I’m stopping to smell the roses. Thank you for sharing this with us. It is things like this that cause us to keep our memories alive. Everyone one of you guys were this best. I remember that Bob Hope Christmas show mainly because I didn’t go. I was very short at the time (discharge date Jan. 19, ’71), and since a acquaintance had recently been killed in an RPG attack on the road to Long Binh which I had driven many times myself, I didn’t want to take the chance. As I recall, everyone in 31st HHC was offered the chance to go. I understand Frank’s comment well. All it takes is the smell of diesel burning and I am transported back to 1970. But strangely, although I recall many names from high school, the names of my companions in RVN often escape me. I remember well my closest pal there, Lee Luce from Boston, but others, even though I have photos of many of them, don’t register as names. I plan to put together a rouges gallery of people I photographed in Vietnam and send it to Bob. Perhaps he will post them, and names and faces can be put together again. we were hitch hiking out of Saigon. It is a long story so I will spare you the details because we were lucky to get home alive. 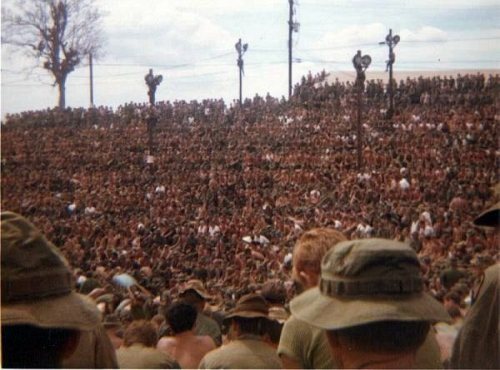 Charles, I was with 191st MI Det, Phuoc Vinh Sep 69- Aug 70. Attended Bob Hope show in 69, took 4 or 5 rolls of pictures. Lost them all when I sent them off to be developed. Still got the memories in my mind though. Welcome home ‘Brother’. My God men. It has been 45-50 years since our time at Phouc Vinh. We all has various health related issues which are both a reflection of time and genetics and our choices over these many years. We can’t blame all our health issues on one factor.